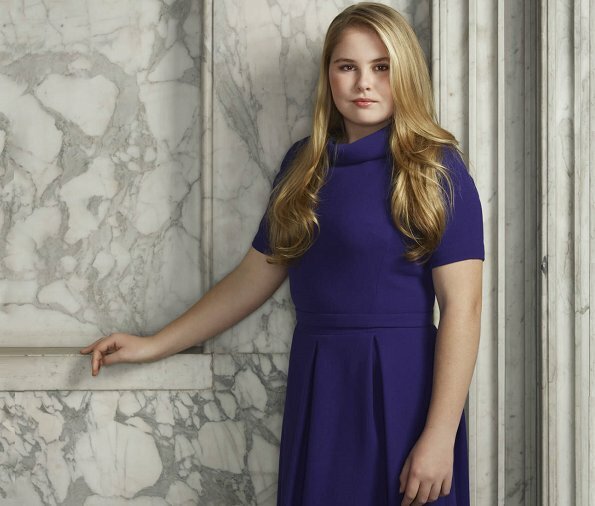 Today, Crown Princess Catharina-Amalia celebrates her 15th birthday. Catharina-Amalia Beatrix Carmen Victoria, the Princess of Orange, Princess of the Netherlands, Princess of Orange-Nassau, is the eldest daughter of King Willem-Alexander and Queen Maxima. The Princess was born in The Hague on 7 December 2003. On April 30, 2013, Princess Catharina-Amalia has borne the title Princess of Orange. This title can only be held by the heir to the throne. Happy 15th birthday, Princess Catharina-Amalia. (The photo was taken by photographer Erwin Olaf in March 2018 at Royal Palace). Our next future queen of the Netherlands, Iam a proud Dutchman & I love the Dutch royal family, hartelijk gefeliciteerd!!!!!. Holland is not new to queens in their own right, e.g. Beatrix, Juliana, Wilhelmina, but it will be the first time for Sweden, Norway, Belgium and Spain. As for Spain, there is a HUGE list of them! Isabella I of Castile the Catholic (ruled 1474–1504) - After a struggle to claim her right to the throne, she reorganised the governmental system, brought the crime rate to the lowest it had been in years, and unburdened the kingdom of the enormous debt her brother had left behind. Her marriage with Ferdinand II of Aragon brought stability to the kingdoms that became the basis for the political unification of Spain. Her reforms and those she made with her husband had an influence that extended well beyond the borders of their united kingdoms. Isabella and Ferdinand are known for completing the Reconquista, ordering conversion or exile of their Muslim and Jewish subjects in the Spanish Inquisition, and for supporting and financing Christopher Columbus's 1492 voyage that led to the opening of the New World. Joanna of Castile and Aragon the Mad (ruled 1504–1555) - successor of the previous. After her husband's death she was deemed mentally ill and was confined to a nunnery for the rest of her life. Her father, Ferdinand II of Aragon, was regent until his death, when she inherited his kingdom as well. Je hebt aan deze nota wel een hele tijd gewerkt, of je hebt een heel goed geheugen, dank je wel hiervoor. The most important person in Spain's history...Isabel I de Castilla...."tanto monta, monta tanto..". Jacques is the heir to Monaco (even though Gabriella is older). It would have been nice to have a special birthday photo instead of an older one; however, she looks beautiful. Can't believe it's been 15 years. She's a beautiful girl but that dress makes her look much older than 15. Teresa, "tanto monta, monta tanto Isabel como Fernando", no está en Salamanca, sino que es algo mucho anterior cuando Castilla y Aragón se unieron por matrimonio. Por favor, deja de hscer el ridiculo, si no eres de España..¿por qué no te callas?, frase de Don Juan Carlos..
Teresa, el castellano no es tu lengua materna...no le des patadas al diccionario...deja a Barbara que sabe lo que dice..
I’m feeling old once again! I remember when she was born and her parents posed with her at home. Love young lady! Oui mais à cet âge là on veut se vieillir . Foto is wel al een half jaar oud. Ze ziet er mooi uit in dit kleedje en zo volwassen, net 18 jaar-dat is geen kind meer. Zij is 15 en niet 18, Gilberte. Maar zij ziet well 18 uit, moet ik well toeegeven, en dat vind ik niet so goed. Ik zie geen rede om eerlijke jeugdejaren zo weg te geven. Make-up is gedeeltelijk verantwoordelijk daarvoor. Zij draagt ook een dames kleed, met 60 zou dit kleed nog passen. Happy Birthday- time does indeed fly by. She's growing up into a lovely young woman. Teresa...cállate guapa...,no sabes lo que hablas..
Teresa, would it be do difficult for you to read the very interesting comments from Barbara, without you adding and showing that there is more? I don't think she was trying to tell us the entire and very long history of the Spanish kingdom. Also correcting the comnent of " tanto monta monta tanto", obviously you missed the very important point that Spaniards use this phrase in a colloquial way, exactly as Anonymous did, and without utilizing the entire incription . SMH!! The future Queen of the Netherlands look very nice, Beautiful young girl. And let me say a very happy 15th Birthday. Growing into a lovely young lady. Less make-up would have been perfect. Happy birthday!